The most prevalent connection options supported by graphics cards and gaming monitors are HDMI, DisplayPort and DVI. There is also VGA, which is not completely deprecated yet and which we will touch on a bit later. Gamers must often choose a particular connection type or arrangement. Such choices have become more difficult with the rise in monitors that offer resolutions beyond 1080p as well as refresh rates beyond 60 Hz. Just five years ago, these choices were not common and you could opt for any of these connections without much consideration at all. This is no longer the case. Any choice you make could actually limit the resolution and/or refresh rate of your gaming experience. Therefore, gamers need to know the capabilities of their equipment and make an appropriate choice. Before we tackle the various gaming scenarios, we will define the connection options. These descriptions are meant as brief overviews of these interface types within the context of gaming. HDMI is an acronym that stands for High-Definition Multimedia Interface. It is a proprietary video and audio interface designed to transmit both uncompressed and compressed data between compliant devices. HDMI continues to evolve. Although it lagged behind DisplayPort when DP was first released, HDMI version 2.1 supports resolutions up to 10K and supports 4K @ 240 Hz. HDMI is available in three formats with Type A being the standard configuration. Type B, which is also known as mini-HDMI, and Type C, which is also known as micro-HDMI, are also available. However, neither Type B or C are particularly prevalent among graphics cards and gaming monitors. Note that as of this writing, HDMI 2.1 is still new. The specifications are not widely supported by manufacturers, which means that a lot of equipment that supports HDMI is still limited to 4K @ 60 Hz. At 1080p and 1440p, even older versions of HDMI can handle refresh rates up to 120 Hz. The acronym DVI stands for Digital Visual Interface. DVI differs from HDMI and DP in that the implementation focuses exclusively on video rather than audio and video. Although DVI was quite leading edge less than a decade ago, its appeal was short-lived. Both HDMI and DP are generally superior options for gamers, and once VGA has been fully deprecated we can probably expect DVI to be next. That said, DVI is still a viable option for gaming. 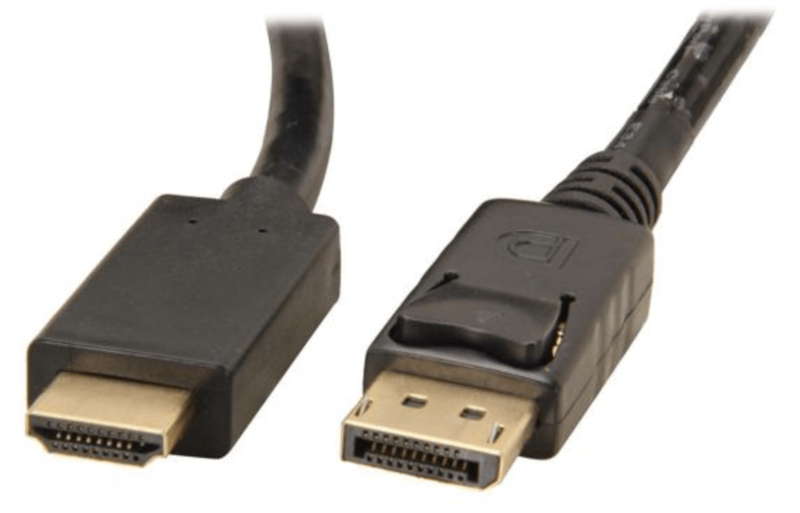 DVI is available in two different formats: single-link and dual-link. Dual-link is more robust and much more common among graphics cards and computer monitors. There are also various pin configurations, such as DVI-A, DVI-D, and DVI-I. The DVI-D pin layout is much more prevalent among graphics cards and computer monitors. Dual-link DVD-D can support resolutions up to 1440p, but at 1440p, it is limited to a refresh rate of 60 Hz. At 1080p, however, it supports up to 144 Hz, which is the chief reason DVI-D remains fairly common. DisplayPort, which is often abbreviated DP, is quite similar to HDMI. The signal is essentially the same, and manufacturers of PC hardware and peripherals were largely motivated to come together and design it in order to avoid the royalty fees that HDMI requires. It also let them create a PC-centric connection that would replace DVI and VGA. HDMI had always been first and foremost a TV-centric connection. DP is more robust than HDMI in that it can not only transmit uncompressed and compressed video as well as audio but also USB data and other data formats too. Although DisplayPort does not yet support 10K, it already has fully realized support for 8K and 4K, and it can display both resolutions at refresh rates up to 240 Hz. In addition to the standard DP format, there is a mini-DisplayPort format available. It is worth noting that while DP supports 4K and 8K monitors, there is limited practical use currently. 8K monitors are rare, and 4K monitors in the average gamer’s budget are just starting to appear. The 1080p 60Hz monitor has been the standard gaming monitor for a long time, and it will continue to be for some time still. If this is the monitor you have and will have for some time, then all three connection types are suitable options. There is nothing DP and HDMI can do at 1080p @ 60 Hz that DVI cannot. If you have a 1080p monitor that supports higher refresh rates, all of these connections will still work. DVI supports 1080p up to 144 Hz. DP supports it up to 240 Hz. Only HDMI is limited at 120 Hz. Note that with DVI a dual-link cable is required. Single-link cables do not facilitate the upper refresh rates. The practical reality at 1080p is that any connection type is fine. But if you have a 144Hz monitor and an alternative to HDMI, then you should switch over to it if you have not already. DisplayPort, HDMI and dual-link DVI all support 1440p gaming. However, if you opt for a 1440p monitor that supports a refresh rate greater than 60 Hz, your options narrow. You could still use DVI, for instance, but only up to the maximum rate that connection supports rather than the monitor. The decision-making process can be a bit murkier if accommodating either G-Sync by Nvidia or FreeSync, which is a rough equivalent offered by AMD. G-Sync requires DisplayPort. It will not work without it. FreeSync does work over HDMI. However, the earliest FreeSync gaming monitors required the variable-refresh feature of DP, a requirement which was later overcome. So, depending on the age of your monitor, you may need to determine if it supports FreeSync fully or has the limited earlier implementation. 1. 1440p @ 60 Hz – DisplayPort, HDMI and dual-link DVI work fully. 2. 1440p @ 144 Hz – DP 1.2+ and HDMI 2.0+ work fully . DVI does not work. 4K gaming is leading edge to say the very least. As we create this article, the 4K gaming monitors available at Amazon are just starting to be priced at what the average gamer can afford. This transition is made more difficult in that even the most powerful graphics cards are struggling to deliver the 4K resolution at the frame rates that many PC gamers have come to expect. 4K resolution is 3840 by 2160. DVI and some older versions of HDMI actually top out at a refresh rate of 30 Hz. Even the newer versions of HDMI are limited to 60 Hz. Up to 60 Hz with DVI is possible in certain scenarios, but you actually require two dual-link DVI cables to make it work. DisplayPort is preferable since with version 1.4 it can handle 120 Hz. Prior to 1.4, it shares the 60 Hz limitation with HDMI. Note that we will not continue beyond 4K. 8K gaming is not really feasible as of this writing even if you have the budget. Gamers are probably five years away from 8K at the very least. 1. 4K @ 30 Hz – DP 1.0+, HDMI 1.3+ and dual-link DVI work. 2. 4K @ 60 Hz – DP 1.2+ and HDMI 2.0+ will work. DVI usually will not work. 3. 4K @ 144 Hz – DP 1.4+ and HDMI 2.1+ will work. DVI will not work. Be mindful that most of the monitors and graphics cards aimed at gamers—and even many of the products aimed at a more casual audience—include multiple options. It is not unusual for monitors and graphics cards to support DVI, HDMI, and DisplayPort with at least one connection each. With graphics cards, you will often get one DVI but two HDMI and two DisplayPort. Some manufacturers provide three of DP or HDMI, so 1xDVI 3xDP 1xHDMI and 1xDVI 1xDP and 3xHDMI are common configurations. This can make your choice a bit easier. If perhaps you are buying a new monitor now but waiting a bit for a new graphics card or vice versa, you will have all the options needed for a decision later. Just make sure to choose the connection now that lets you maximize the capabilities of your hardware. Something else you may need to consider is a multi-monitor setup. These are quite popular among gamers even if they do not actually use the second or third screen for gaming. That second monitor can provide you convenient access to a lot of information while you game and/or broadcast. Be mindful that if you do not use the second or subsequent monitor for gaming, then you do not need to worry about the connection type as much. HDMI, DVI or even VGA is fine. If you do intend to game, then you generally need to mirror the monitor resolutions and refresh rates as well as the connections. In fact, triple-monitor setups are why 3xHDMI and 3xDisplayPort configurations are so common. The acronym VGA stands for Video Graphics Array. It was introduced in 1987 and remained the standard for computer monitors and graphic cards for a very long time. It is outmoded, but many manufacturers still support it for legacy purposes due to just how long it was the standard. You may be surprised to learn that VGA can support some rather high resolutions and refresh rates. That is not a problem. What is that problem is the VGA is an analog signal and the connection pins are easily bent. Both HDMI and DisplayPort are able to carry audio signals. Neither DVI nor VGA can. If you choose either of those connections, then you will need to determine an alternate audio solution. The best interface for you is the connection type that lets you play games at the highest resolution and refresh rate that your monitor supports. If you are still playing at 1080p @ 60Hz and do not plan a change soon, do not worry about. Use whichever is most convenient. If rather you intend to play at higher resolutions and/or refresh rates, choose your interface accordingly. If you can play at higher resolutions or refresh rates but are limited by your cable choice, then make that upgrade a priority! Avoid VGA. It should only be used as a last resort. In addition, if both your monitor and graphics card support DisplayPort, then you cannot go wrong with that choice. DP cables are relatively inexpensive, and this should remain the primary video and audio connection for computers going forward. As a rule of thumb, gamers should avoid making decisions based on future-proofing. Gaming is constantly evolving and sometimes it evolves fast. Future-proofing is this ideal that is usually impossible to attain, and it often causes you to spend more now or make an unnecessary sacrifice. DisplayPort is the present and future of gaming. It is better designed for PC. HDMI will make strides, but it is hard to imagine it surpassing it for PC use at this point. The broader appeal of HDMI is not going anywhere, and most mid-range to high-end computer equipment will continue to support it.